This carbon fiber panel replaces our previously offered individual Upper and Lower (shifter) center console panels, and also incorporates a new ashtray panels. 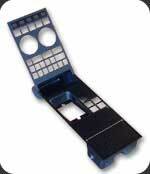 This one-piece unit provides an incomparably elegant solution for those desiring center console panel replacement. This carbon fiber panel is a direct replacement for the stock plastic parts, which are prone to warping and turning "gummy". The console comes with pre-drilled attachment holes, threaded metal, and molded-in mounting studs on the backside of the part. It fits all models and years of the Ferrari 348, with no modifications to either the part or the vehicle. The stock shift gate, guages, 12 volt power adapter, and all buttons fit securely in place with stock hardware. Console attaches to vehicle with stock hardware. Thick urethane clear coat provides incredibly smooth, deep gloss and excellent durability. This carbon fiber shift knob is a direct replacement for the stock shift ball. This beautiful, handcrafted component is not simply a layer of carbon fiber fabric laminated around an existing knob, but rather a fully engineered composite solution, with an aluminum threaded insert. It will fit directly onto 348 vehicles; no modifications to the original part or the vehicle are necessary. Thick urethane clear coat provides incredibly smooth, deep gloss and excellent durability. A colored horizontal stripe is optional. This parking brake handle is a direct replacement for the stock plastic piece. This beautiful, handcrafted component is not simply a layer of carbon fiber fabric laminated on top of a stock plastic piece, but rather a fully engineered composite solution. It will fit on 348 vehicles with stock hardware; no modifications to the original part or the vehicle are necessary. Thick urethane clear coat provides incredibly smooth, deep gloss and excellent durability. This carbon fiber Gauge Cluster Panel provides an easy yet top quality solution for upgrading the look of the primary gauge pod. It fits all models and years of the Ferrari 348, worldwide, with no modifications to either the part or the vehicle. Unlike all of our other parts which replace the original, the Gauge Cluster Panel fits over top of the existing plastic gauge panel, and attaches to vehicle with supplied double-sided mounting tape. All warning lights remain visible to the bottom and sides of gauge panel. No tools are needed; it is not necessary to move the steering wheel or remove any hardware from the car. Thick urethane clear coat provides incredibly smooth, deep gloss and excellent durability. This carbon fiber inside door mirror trim is a direct replacement for the stock plastic or metal triangles on the inside of the side view mirrors. Comes with pre-drilled mounting holes, allowing quick installation with stock hardware. Available for all 348 models. Mirror trims are sold as a pair. 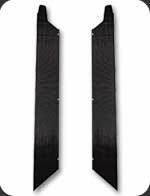 These carbon fiber door sills are a direct replacement for the stock steel sills, which frequently become dented and rusty. The sills come with pre-drilled attachment holes and top-quality 3M mounting strips along the outboard edge. They fit all versions of the Ferrari 348, with no modifications to either the part or the vehicle. The sills now feature a longitudinal crease similar to the style featured in the F355 Fiorano edition. They do not include the down-turned outboard lip which tends to trap water. Thick urethane clear coat provides incredibly smooth, deep gloss and excellent durability. Sills are sold as a pair. This carbon fiber spoiler lip for the Ferrari 348 is similar to the fiberglass "speciale" lip, but much stronger. It features carbon fiber/Kevlar sandwich construction with a urethane clear-coat finish. Mounting holes are pre-drilled on the underside for installation with 1/8" rivets (not included).